Know Your Environment – Determine the safest place in each room. Identify the locations of all exits, utility shut-off valves, and storage sites for emergency supplies and equipment. If child care services are offered through a church, school, community center, or employer, check to see that your emergency plan and procedures are compatible. Maintain Routine – Try to closely maintain normal diets and routines for all age groups. Infants will not understand or respond to emergency instructions. Therefore, you should place special emphasis on ensuring that their environment is as safe as possible. For example, cribs should be placed away from untreated windows and tall, unsecured bookcases and shelves that may slide or topple. Store, at the minimum, a 72-hour supply of extra water, juices, formula, diapers, food, and clothing. Use strollers, wagons, blankets, and cribs with appropriate wheels to transport infants if evacuation is necessary. Children with special needs require all of the above, plus additional assistance. Include provisions in your plan for extra staff, parents, and older children to help them. Drills can save lives. 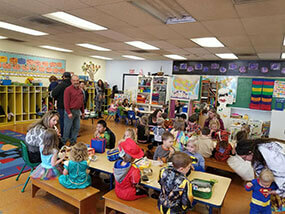 Child care centers should conduct and document drills every six months. Teach staff and children to “duck, cover, and hold” using sturdy tables or desks for protection. In a room with no sturdy tables or desks, have them crouch down and cover their heads with their arms, ensuring that the backs of their heads are protected. Outdoors, have them duck, cover, and hold in an open area away from power lines and other hazards. Survey staff, parents, and members of the community to identify professional assistance (architectural, structural engineering, nursing, etc.) and resources which might be provided on a volunteer basis. Conduct internal and external hazard assessments of the facility. Child care providers tend to store heavy, breakable items high and out of the reach of children; however, these items can become dangerous missiles during an earthquake. Instead, store heavy, potentially breakable items in low, secured cabinets. Take special care to secure or remove any items above the head levels of the children. including televisions, hanging plants, air conditioners, and aquariums. Have windows treated with film to prevent glass shards from causing injuries should windows shatter during an earthquake. Have a professional survey the building for structural integrity.